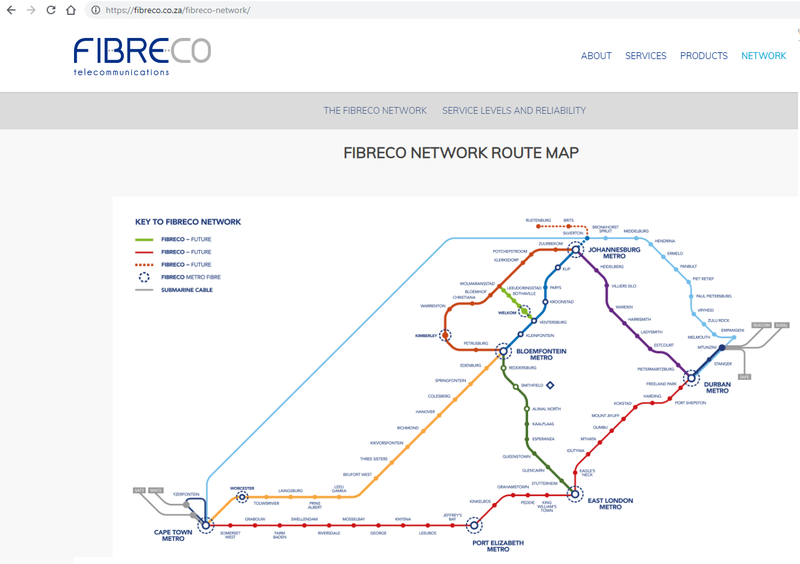 SEACOM, which operates subsea cable systems encircling the African continent, agreed to acquire FibreCo Telecommunications, which owns and operates a national open access dark fibre network in South Africa. 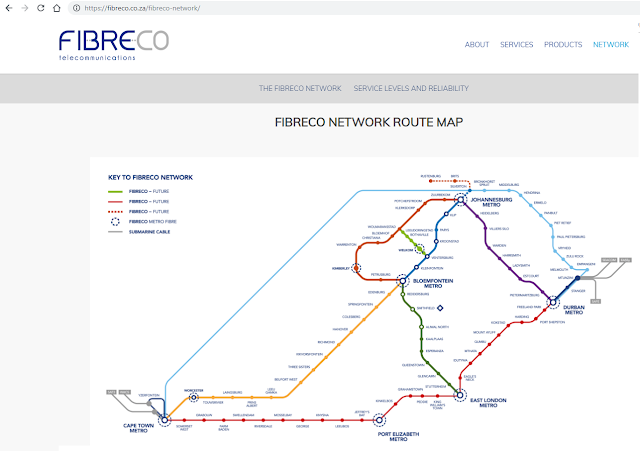 FibreCo connects over 60 points of presence across South Africa, including major data centres in Johannesburg, Cape Town, Bloemfontein, Durban, Port Elizabeth and East London. FibreCo’s network also connects the SEACOM subsea cable system (which lands in Mtunzini on the east coast of South Africa) to the WACS cable (which lands at Yzerfontein, on the west coast of South Africa), enabling fully redundant high-speed ring protection for diversity around the African continent. 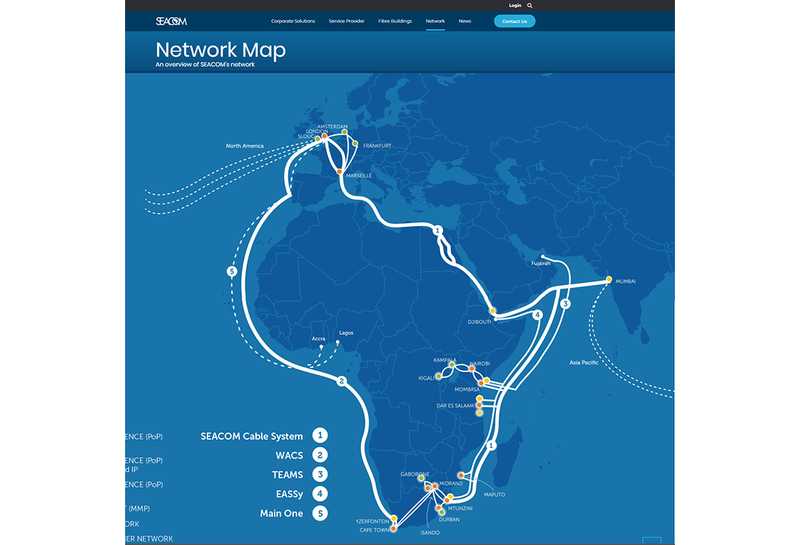 SEACOM said the FibreCo acquisition significantly strengthens its operations in South Africa by creating a platform for the expansion of its business services. The acquisition is subject to approval by the South African Competition Commission. The MARS subsea cable has landed on Rodrigues Island, a 108-square-kilometre outer island with a population of 41,000 that forms part of the nation of Mauritius. MARS, which is the first submarine cable system to connect the islands of Mauritius and Rodrigues, was deployed by Huawei Marine on behalf of PCCW Global. The 730km cable uses Huawei's advanced 100G WDM transmission technology for system design capacity of 16 Tbps. The Optical Society Foundation (OSAF) and Coherent, Inc. announced the establishment of an annual Bernard J. Couillaud Prize, a merit-based award to support early-career OSA members who are engaged in ultrafast photonics research and application development. Each Bernard J. Couillaud award will total $20,500 with up to an additional $5,000 in travel expenses to attend an OSA scientific conference. Deadline for application for the first prize is 08 March, 2019. The inaugural winner will be announced at CLEO: Laser Science to Photonic Applications, San Jose, CA USA, 5-10 May 2019. The prize honors the extraordinary contributions of laser physics pioneer, Bernard J. Couillaud, who was a former President and CEO of Coherent (1996-2002) and later served as Chairman of the company’s Board of Directors (2002-07). He had joined the firm in 1983 after a three-year visiting fellowship at Stanford University, where he contributed to the development of the Hänsch-Couillaud technique of laser frequency stabilization. At Coherent, he was instrumental in the development of numerous dye, DPSS and Ti:S lasers. A native of France, Couillaud received his Ph.D in laser physics in 1978 at the University of Bordeaux where he helped pioneer continuous wave and pulsed dye lasers. He passed away in 2017. Coherent CEO John Ambroseo said Couillaud “had the rare ability to combine a passion for physics, lasers and photonics with business. He consistently nurtured and encouraged younger people to innovate and develop their own ideas. We believe this prize will honor that legacy." Cloud Block Store for AWS - designed to enable mission-critical applications to run seamlessly in the cloud, Cloud Block Store enables hybrid mobility and adds new storage services to webscale applications. CloudSnap for AWS - cloud-based data protection, built right into Pure FlashArray. CloudSnap allows FlashArray snapshots to be easily sent to Amazon Simple Storage Service (Amazon S3), which enables cost-effective protection in the cloud along with flexible recovery both on-premises or in the cloud. StorReduce - cloud-native deduplication technology, designed to enable fast, simple, cost-effective cloud backup to AWS S3 storage, in conjunction with on-premises flash for fast recovery. 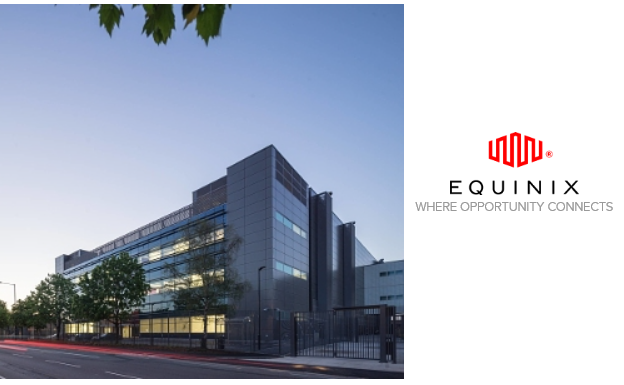 Pure Storage reported revenue of $372.8 million for its third quarter ended October 31, 2018, up 34% yoy, and exceeding the high end of the company's guidance. Gross margin was a record 66.8% (GAAP) and 68.1% (non-GAAP). "Pure delivered another excellent quarter, and today we're announcing the extension of Pure's data centric architecture to the cloud," said Charles Giancarlo, Chairman and CEO, Pure Storage. "With the launch of our new Pure Storage Cloud Data Services, we're bringing our storage software directly to the public cloud in partnership with AWS." 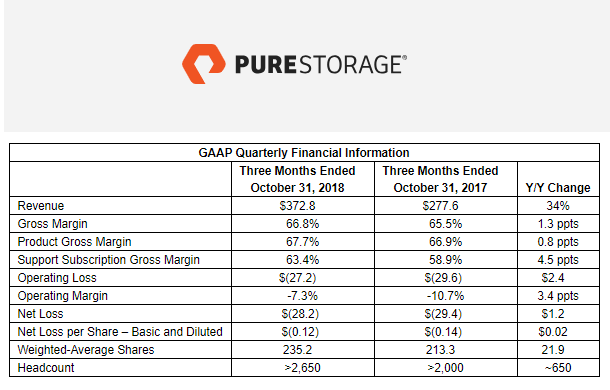 "Q3 was a strong quarter for Pure with revenue and margins exceeding our expectations," said Tim Riitters, CFO, Pure Storage. "As we finish the fiscal year we are excited about the opportunities ahead, and have raised FY19 guidance to reflect the momentum we are seeing in our business." Silver Peak announced enhancements to its global Partner Edge program aimed at driving business opportunity and growth in a hyper-growth market that industry analyst firm IDC projects will exceed $8B USD in 2021. New Partner Tier Criteria: proving all partners with a clear path to understanding what is required at the Silver, Gold and Platinum tiers, including up-front revenue and training objectives. 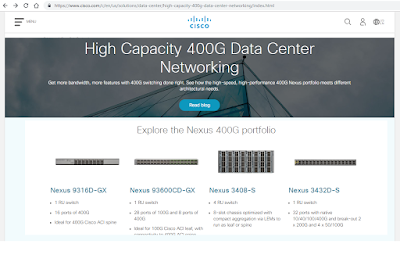 With a more predictable model, partners can tightly align their SD-WAN investments directly to a set of partner rewards, enabling them to see the direct correlation between their investments and revenue growth, margins and profitability. Partner Accelerators: This new program, available to Gold and Platinum partners, creates a set of Silver Peak incentives with the sole purpose of rewarding partners that focus on growth initiatives in selling the Unity EdgeConnect™ SD-WAN edge platform. Incentives will be introduced every 6 months and offered for a period of 6-to-12 months, enabling partners to plan ahead while opening new routes to expanded revenues. The program spans several reward levels and includes partner level, sales and technical team rewards. Partners realize the direct margin benefit to their company when they shift customers away from shrinking hardware margins toward higher-margin software-defined offerings. 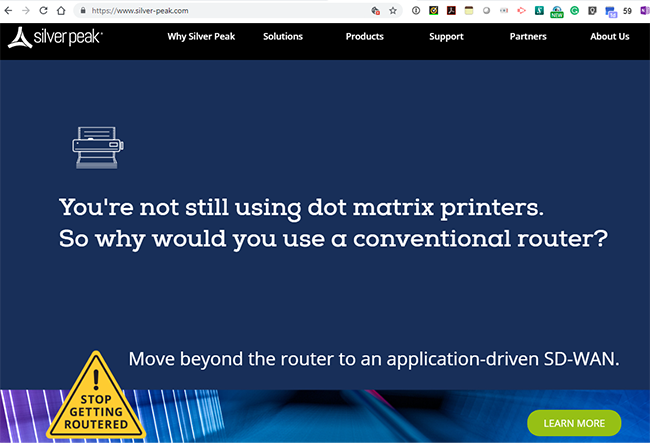 Silver Peak: A new programmatic approach now available to Gold and Platinum partners, enables Silver Peak inside and field sales teams to pass active leads directly to partners in a highly collaborative manner. Engaging partners from the start provides a more focused and measured approach to teaming in front of customers and makes the sales process more predictable, expediting time to revenue for partners. Silver Peak is introducing two new incentives that will be available to Gold and Platinum tier partners immediately. SK Telecom signed a Memorandum of Understanding (MoU) with Keysight Technologies to collaborate on 5G network design development and testing technology. 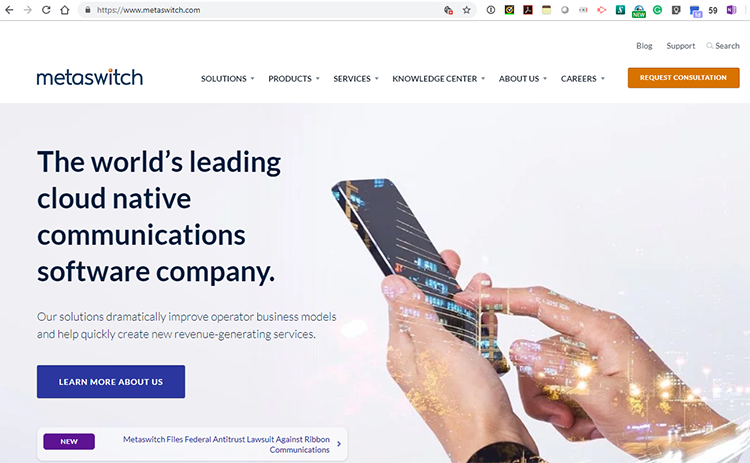 The MoU covers development of 5G device performance validation technology, test cases and processes to help verify that new products perform as intended on the mobile operator’s network. The two companies will also collaborate on Massive MIMO and beamforming to achieve higher data speeds and lower latencies, which many future 5G applications will require.